« Book Collaboration: How to Hygge + Giveaway! Kitchen Makeover | Before & After! 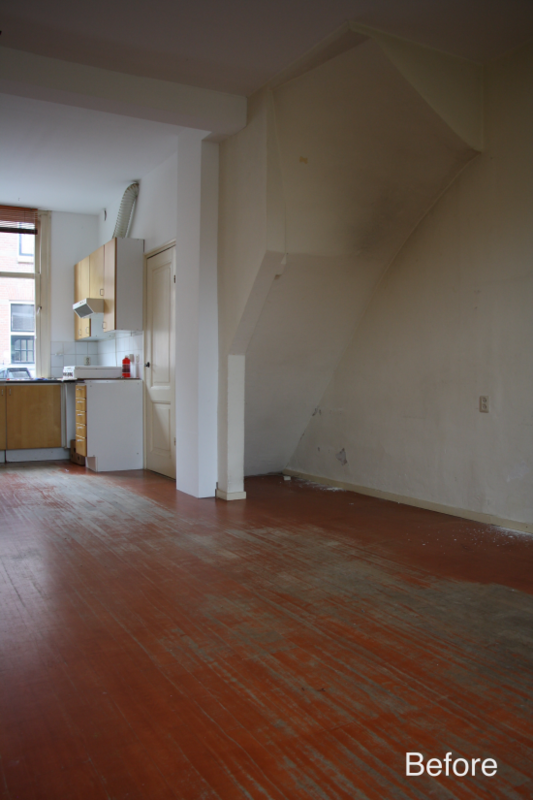 Hey guys, not sure if you remember but about a thousand years ago (a thousand, three… same thing) I wrote about the kitchen makeover we were planning in our new home. 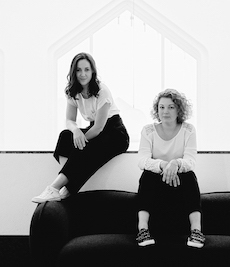 I shared the inspiration with you thinking we’d whip it together in no time, but life happened and with two floors upstairs to work on, a growing business, full schedules and a toddler we had our hands full. 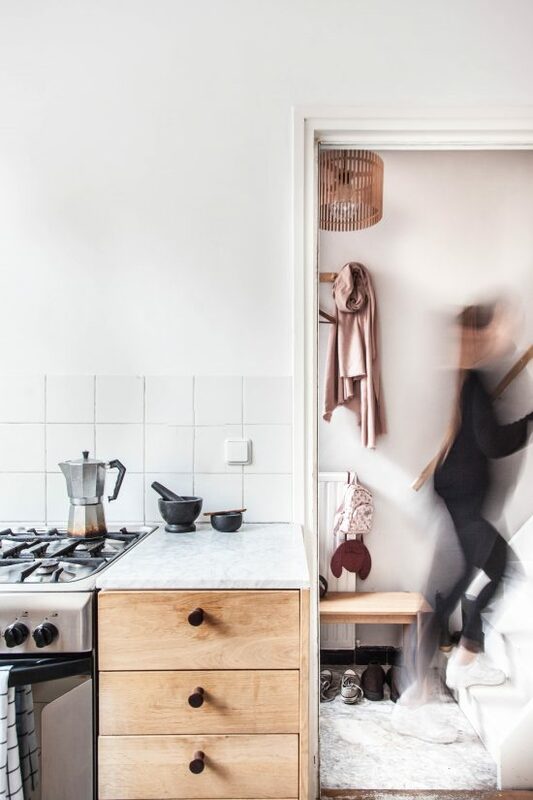 Slowly we chipped away at it, taking breaks in between to concentrate on other spaces, but for several months our kitchen has been at a point where we are satisfied functionally and aesthetically. 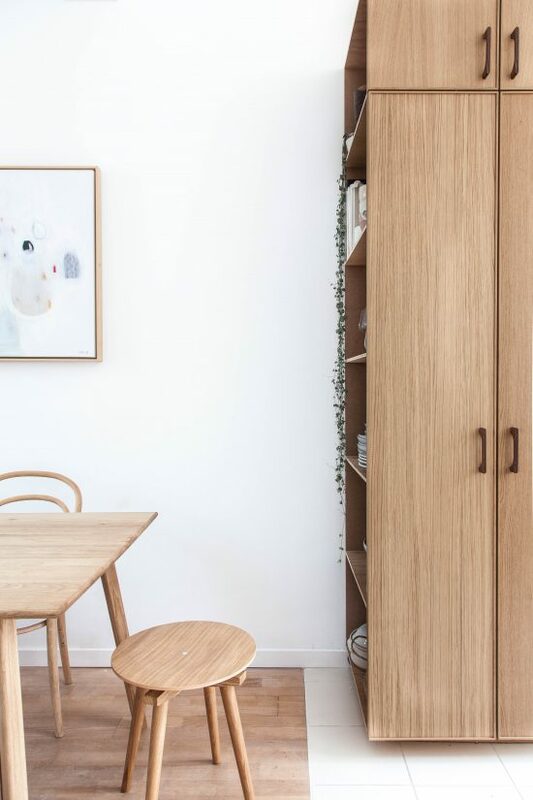 So without further ado, I am thrilled to share some images of our tiny but lovely kitchen having worked hard to transform it from a tired, drab old thing into a fresh, functional and pretty space, and all on a shoestring budget! Since purchasing our place in November 2013, we’ve spent the best part of three years slowly renovating it, doing all the work primarily ourselves. Nothing major, but it was enough to keep us sufficiently occupied for a long time, drain a decent amount of energy as well as euros from the bank account. You know how these things go. They start small and then add up until the original plan gets out of hand and then you do nothing because everything just feels too hard. Renovating our home has been a slow, organic process as we tackled the never-ending list of jobs bit by bit. We had bought a house, a car and got married all in the same 5 month period, so pennies were flying out faster than we could earn them and pausing between each job was a necessity. Long story short, it took a while – as all the best things do – but let’s jump straight into the before and after, shall we? 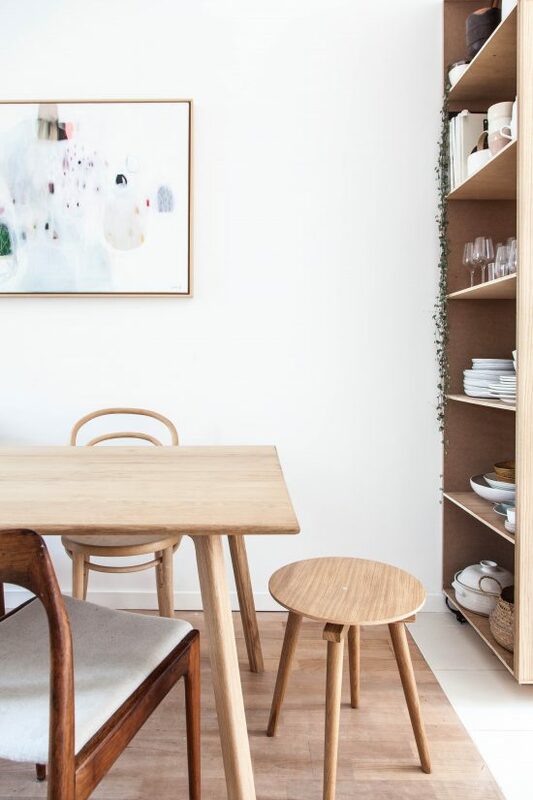 I wanted to have a light-filled, open kitchen with simple, natural details while doing as little structurally to the existing space as possible. I loved the big front window, the light and even the old tiles on the wall. The rest would need some energy, love and a solid vision, and I had plenty of that. The house was very run down and the kitchen was battered to say the least but we were motivated to work with what we had! As you can see, the kitchen wasn’t exactly the selling point of the house, but we weren’t in a position to axe it. 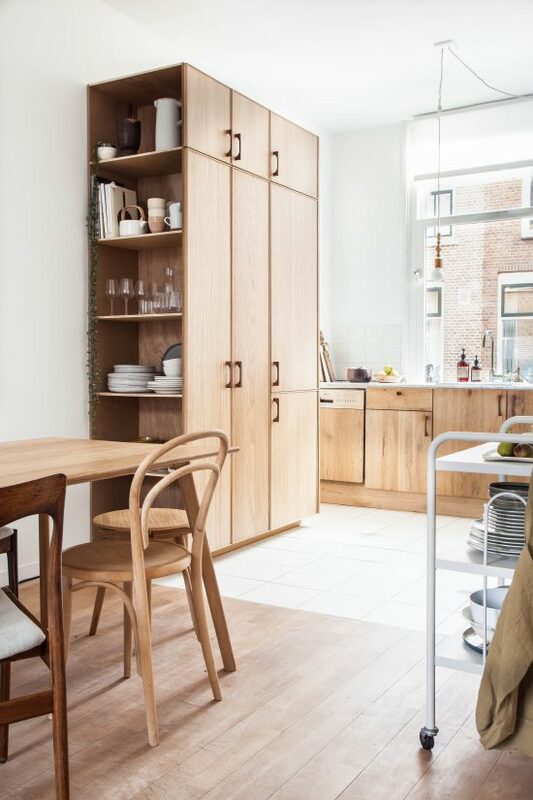 I would gladly have designed a new kitchen that offered us more space/storage, but the existing oak floorboards (yes, those are oak floors there, who would’ve thought?) didn’t continue all the way under the current kitchen so they would have needed replacing too, which just wasn’t an option with a wedding months away. So we rolled up our sleeves and made the best of a grotty situation! We removed the top cabinets, extractor fan and pipe (which didn’t work anymore) and cleaned the hell out of every surface so we could live in it. We painted the walls and woodwork (doors and window frames) white soon after we got the keys, updated the counter tops (more on that later), replaced the sink/tap/dishwasher and also painted the existing cabinets. For a while they looked like this. Which I actually really liked. It took tw0 layers of primer, and three attempts to get the right shade (which in the end I mixed myself) which cost me in total 9 layers of paint, 9 evenings on this here kitchen floor, about 25 grey hairs and a husband who won’t let me live those 9 layers of paint down. But they looked fresh and clean and it was a whole lot better than it was! BUT. 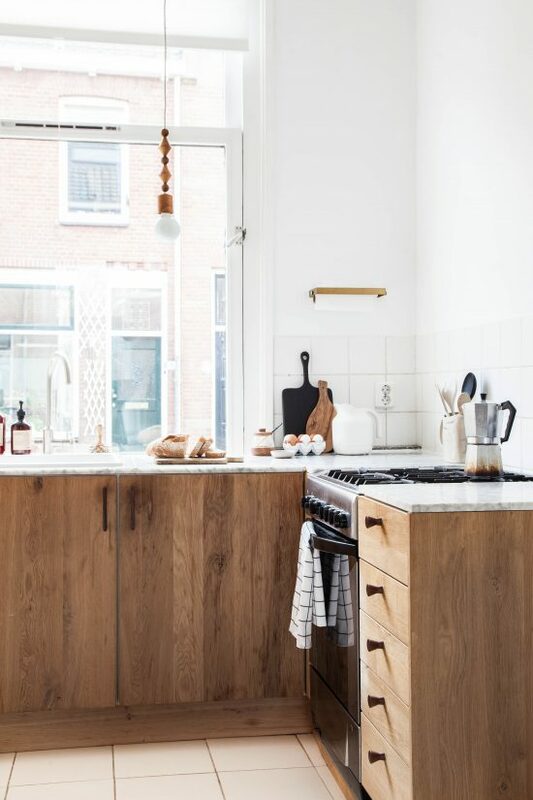 I came across a company called Koak Design who make beautiful custom oak door fronts to work with an Ikea base (they did this kitchen I styled that featured on the cover of vtwonen) and I knew I wanted to add some warmth and texture to the room while maintaining the existing light and openness we had created. When I met Frank and Sandy at their home (which I photographed and have featured since in several magazines) we hit it off and we decided my kitchen would be much better off with some of their oak. In time (probably when we update the floors) I can totally see myself painting the lower cabinets to add contrast and colour. But then my logical mind reminds me that putting paint to solid oak is almost a crime. We’ll see. For now, we love the warm vibe in our kitchen! Despite sanding and re-oiling the existing floors, we just couldn’t live with the floors in the kitchen anymore because there was some really bad water damage making the wood peel up and subsequently catch on our socks or give us a splinter. 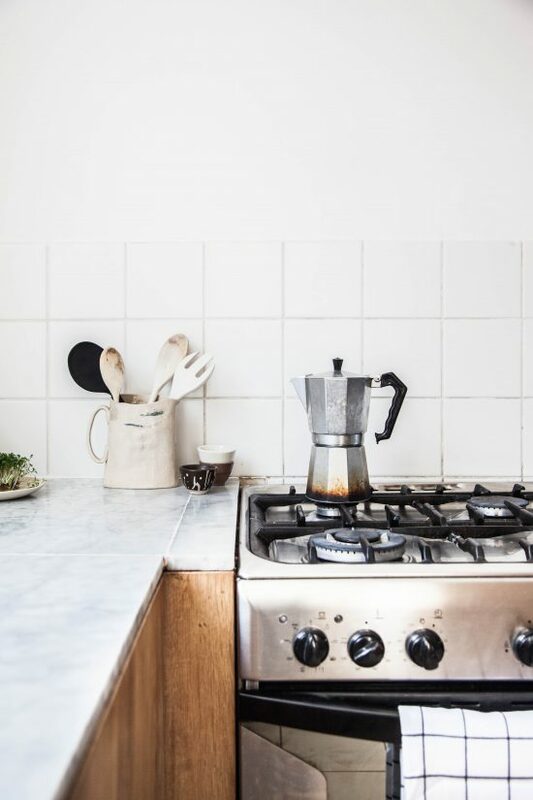 We have every intention of replacing our floors (possibly this year) but to tide us over until then, we replaced just the kitchen section with simple, matte white ceramic tiles from Mosa, with a couple of quirky vintage ones I salvaged from a project interspersed. It’s easy to clean and is practical from a spillage perspective but I am looking forward to the day we do the floors for real. White tiles made the oak fronts stand out, and with a very ‘woody’ kitchen, I was grateful for the break that the floors gave us visually. For the longest time I wanted a marble counter top but I was apprehensive about investing in a beautiful counter top that would get damaged with wear. 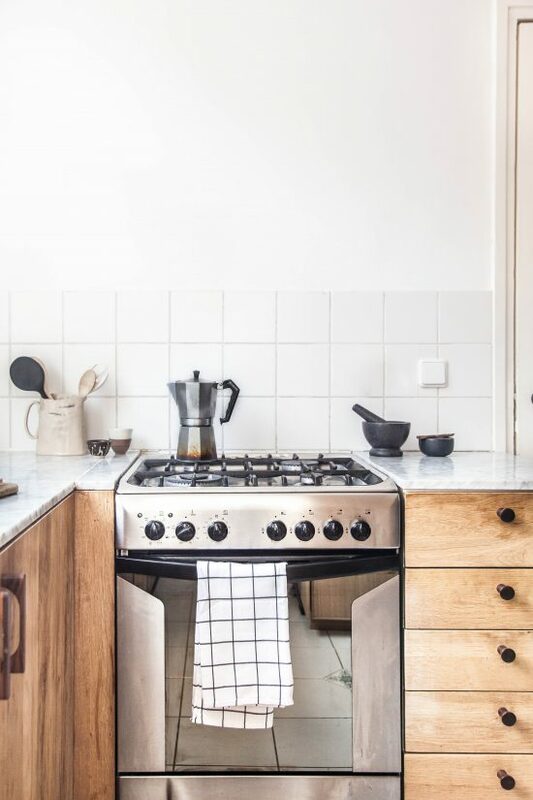 I just couldn’t’ do it without trying marble out with our lifestyle first so we found a place locally that sells leftover stone and marble tiles and found a stack of 60x60cm floor tiles in carrera marble that would work as a kitchen worktop. We had a hole cut out for the sink and tap, had a few smaller bits cut to size and in a day my husband had it installed! The downside of course is the join line every 60cm (which you can see above and in this post I wrote a while ago), but to be honest, I don’t really mind it so much, and the same goes for the damage it has sustained (lemons being the culprit each time). In fact, I’m kind of grateful we went down the inexpensive path in this kitchen. 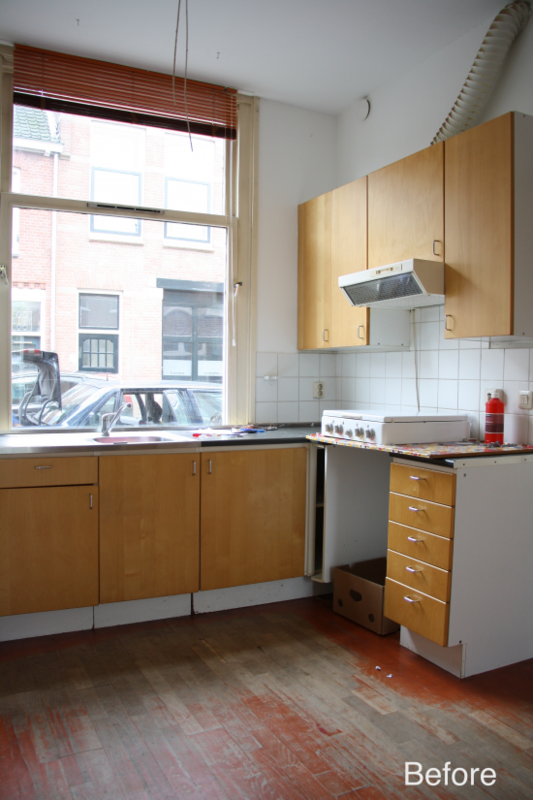 In total, the counter tops cost about 450,- euro doing it ourselves. Knowing after this experience a) how to care for marble, and b) that we really love it still despite the wear and tear, I would happily invest in the real deal in our next kitchen. I know there are many out there that don’t share this view, but I think a few blemishes add to the charm or marble like crinkles do on linen bed sheets. We did a fair bit of recycling and reusing, come to think of it. We managed to make our old gas stove we brought along from our previous rental house (our first major purchase!) fit perfectly, and also scored a dishwasher from family who were updating their kitchen. We had Koak make an oak front for it to match the doors. We kept the existing white square tiles on the wall and updated the light switches and power points for new ones. Such small and inexpensive updates but quite an impressive impact, right? 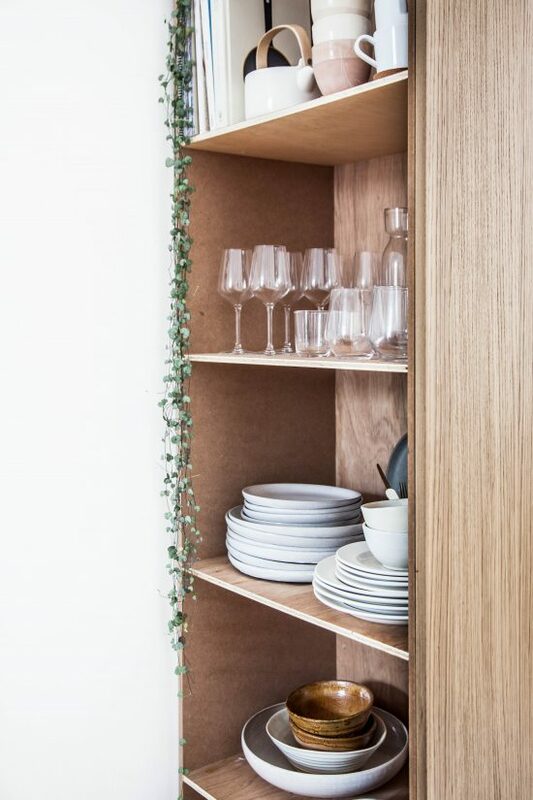 To finish off the door and drawer fronts, I had custom walnut pulls made by Ware Design Works, a small hardware company that I discovered on Etsy whose wooden hardware I love and have used on a few projects now. They made these custom – a matching knob and pull and they’re so gorgeous – sturdy but slender. 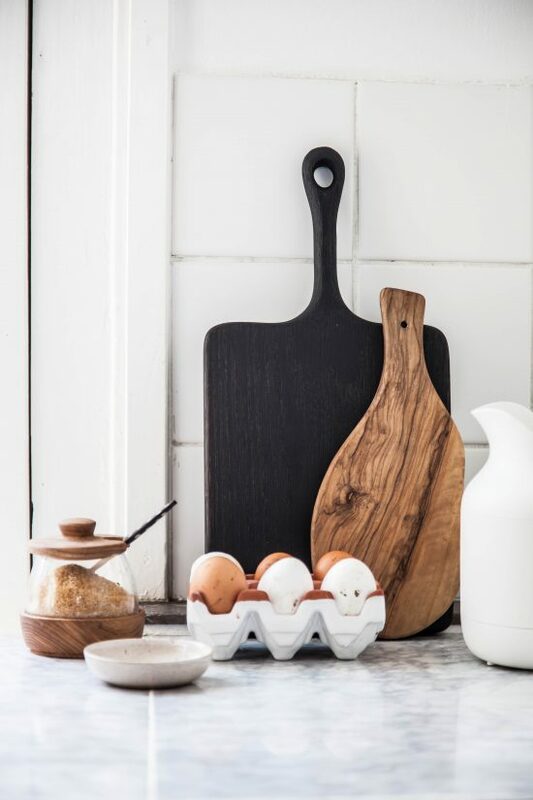 My favourite things in the kitchen are our wooden pendants by Marz Designs, an Australian based lighting and homewares label I just adore (you may remember them from this post). These lights were the very first new pieces we brought into our house and they are just perfect from the start. I love the different tones of oak and walnut together and the mismatched beads on each strand. Mine feature a twisted linen cable which we have draped loosely from two ceiling hooks that I purchased at Pantoufle. My other big love are the brass rails from Schoolhouse Electric. They make me so happy! I obviously don’t keep it strictly functional on here. 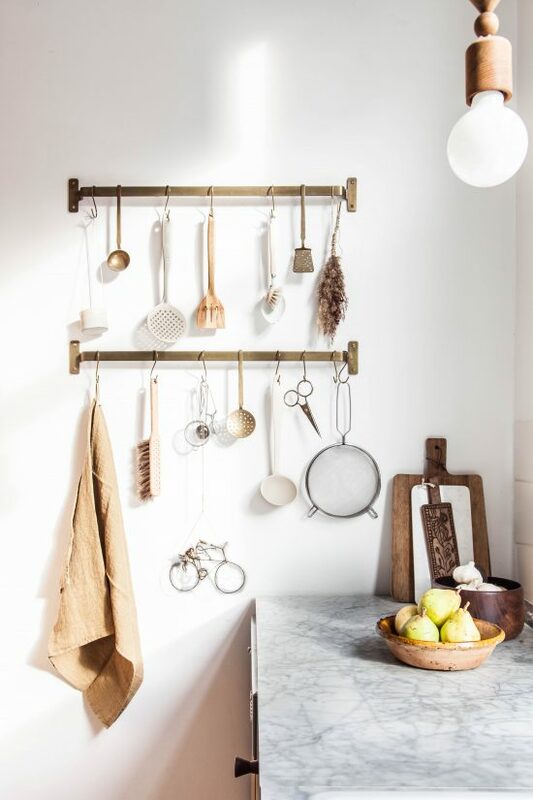 In amongst the practical things I use on a daily basis, I display trinkets and items I love looking at – inherited kitchen utensils, a wooden spoon bought in Morocco, a handmade bicycle hanging trinket I bought my husband at a market in Mozambique years ago, a ceramic tiny planter I found at Hear Hear in Amsterdam. In this photo above you can see how our kitchen connects with our tiny entrance and the staircase that leads upstairs. It’s a very vertical, narrow house, typical of 1920s built row-houses in this part of the world! The downstairs of our home is essentially a long, narrow space with the kitchen at the front window, dining area in the middle and the living at the back opening out into a little garden. Here’s more of the dining area, the living room will follow soon! The final project that took about a year of convincing my husband but that finally happened over the summer was a built-in kitchen element to house our fridge, pantry and act as storage for my ever growing collection of ceramics. We had a free standing fridge for a really long time and it was the first thing you would see when you walked in. I just couldn’t look at it anymore and at the same time, was pretty desperate to add more storage to the kitchen since we only have a few lower cabinets and we are normal people with a ton of stuff. It was a little too asymmetrical but I liked the general concept so off we went to Ikea to scope out what we would need. When we got there, we discovered their Ekestad door fronts and I loved the simplicity of them and the thin edge around the door. I was apprehensive about going for more wood, as we already had the oak fronts on the lower kitchen element, but once we got it up, we decided it was definitely lovely and that was that. Here’s the end result, more symmetrical and so incredibly functional – the doors on the right house the fridge, the middle doors have pantry space and the left most doors are secret 🙂 Can you guess why? What we did plan on doing was painting the side shelving panel, and therefore chose the most inexpensive materials to create the side panels to save some pennies. In the end, we decided we liked it so much just the way it was, despite the fact that there are about 105 different types of wood going on in our kitchen! 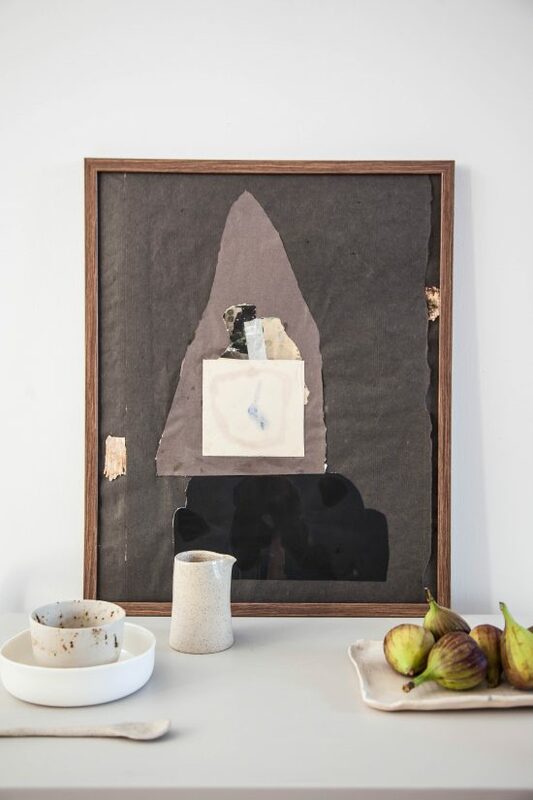 This fabulous piece of abstract art is a Lola Donoghue original. I initially commissioned this abstract to hang in the living room as part of a gallery wall but felt it deserved a wall of it’s own. 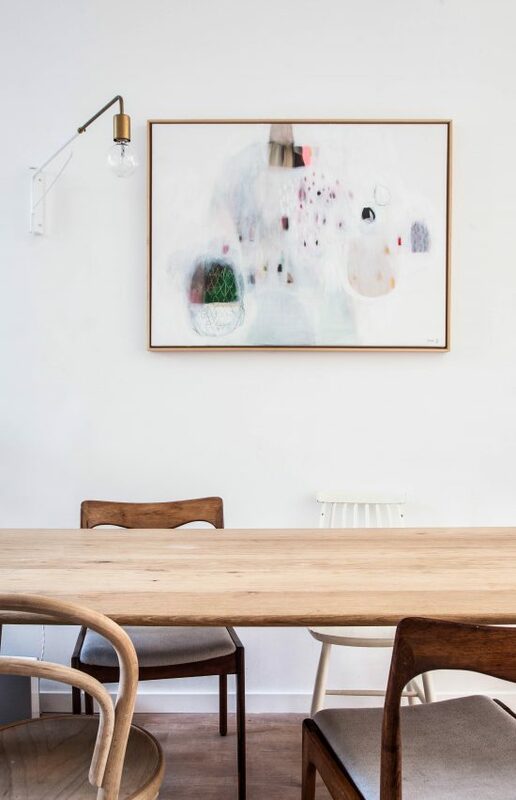 I adore it here over the dining table – a bit of happy colour but not too overwhelming. I like my home and spaces in general very calm, in case you haven’t noticed. The lamp, by One Forty Three, was one of the very first things we bought for the house (along with the kitchen lights). Around our table we have a mix of different chairs. 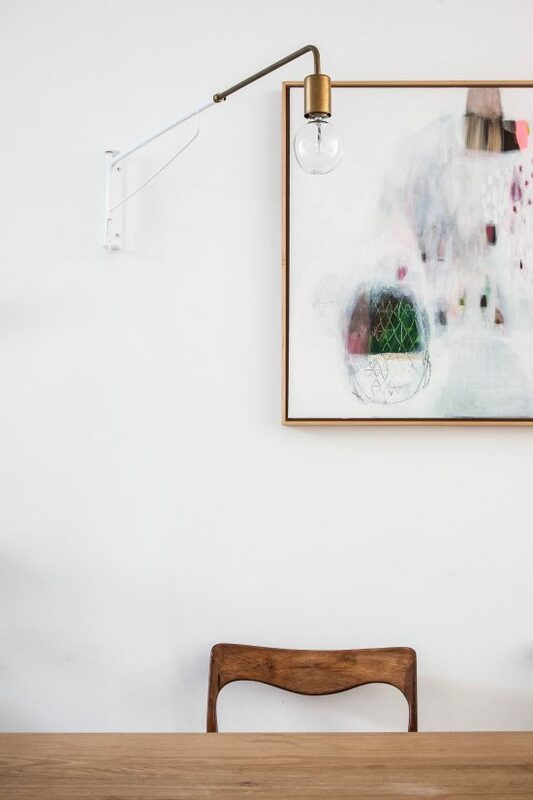 The very comfortable Normann Copenhagen ‘My Chair’ combines with vintage pieces I picked up over the years and a little CC stool by Rex Kralj. 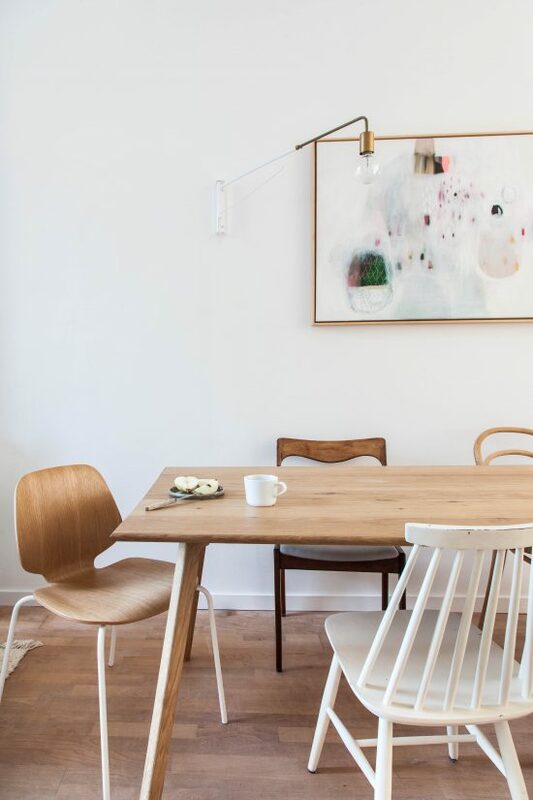 I love the combination of old and new chairs around a table, and the personality it adds. 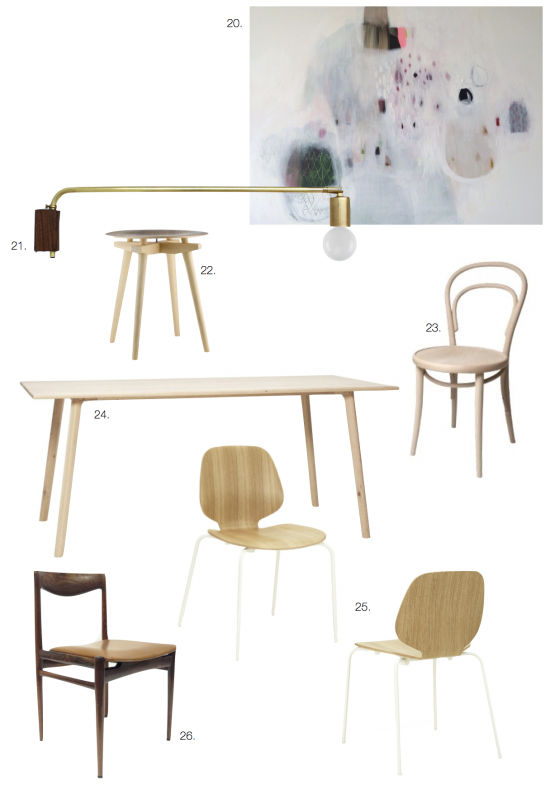 The table itself is from Hübsch – I have used it on several projects and love the simplicity of it. 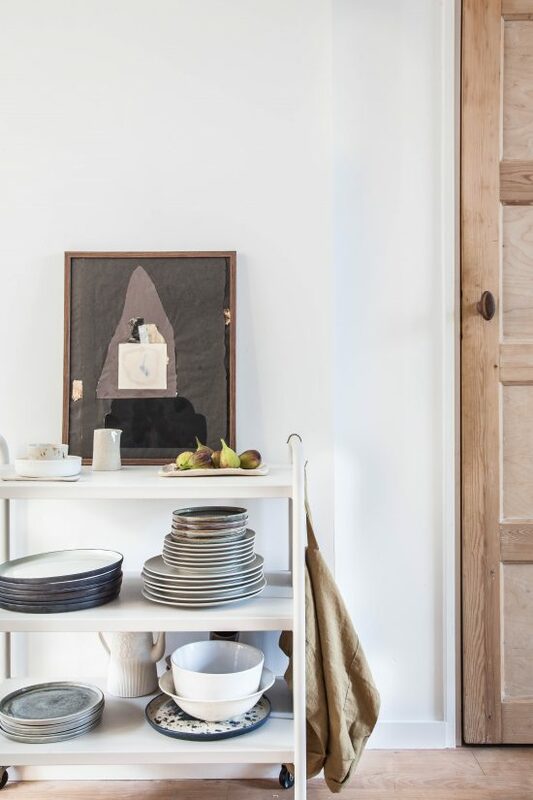 I love displaying my favourite artworks, ceramics treasures, pretty fruit/vegetables and other life-changing and highly functional objects on this trolley and in the display shelves next to the table – some of my favourites include handmade pieces by July Adrichem, Annemieke Boots and JD Wolfe. All our plates, bowls and platters are stored openly for easy access, and the rest is stored away behind doors. My daughter loves it because she can east set the table each evening and thinks it’s fun choosing which plates to use each day! This trolley has now been three colours, starting with army green, then black (remember this post?) and then this lovely, fresh taupe shade. I think we’re there now. Said me never. I am sure it’ll be purple next week but don’t tell my husband because he might just divorce me if I spend another evening paintbrush in had and a look of frenzy on my face while he’s trying to Netflix. Well, folks. That’s my kitchen! Warm, woody, simple, collected and functional. Exactly what we wanted and better that what we hoped for when we bought this tired old house. 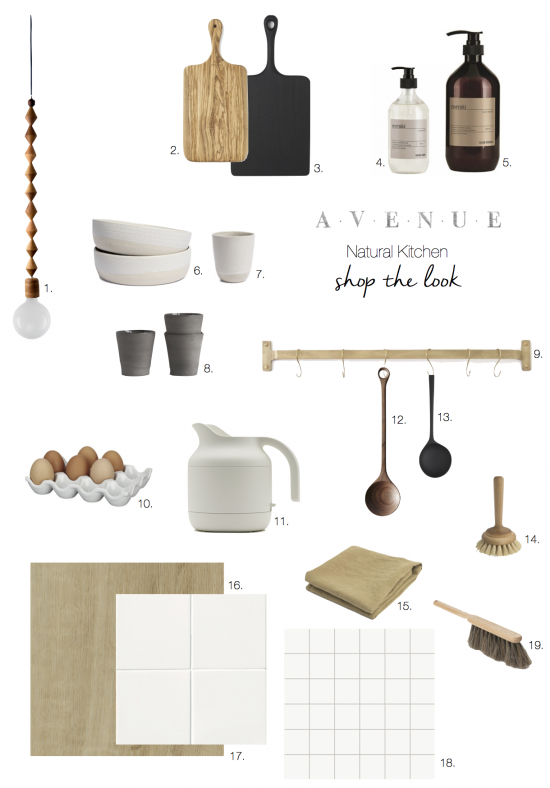 Shop the Natural Kitchen look: 1. 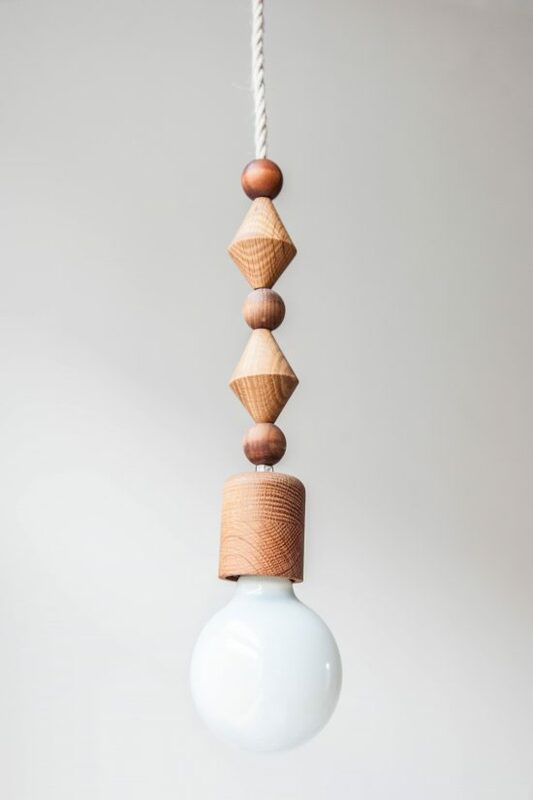 Marz Designs wooden pendant | 2. Wood cheeseboard| 3. Smoked oak cheese board | 4. Meraki hand soap| 5. Meraki dish soap | 6. 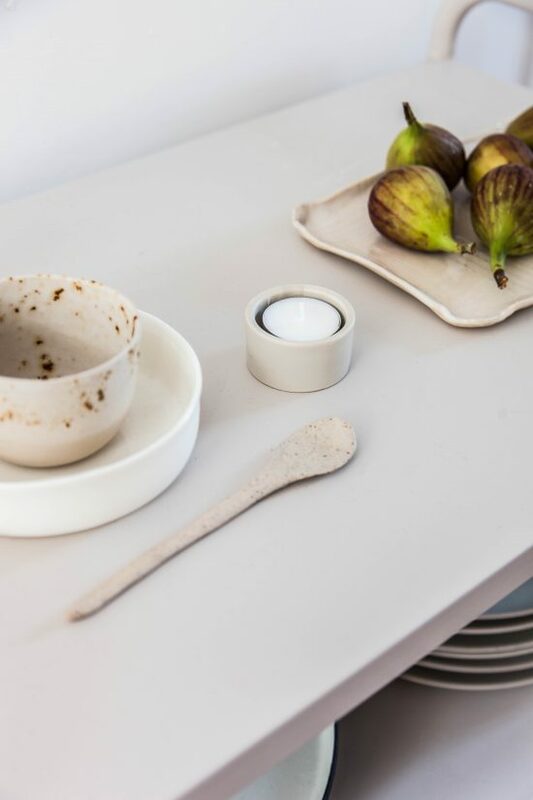 Stoneware bowls Annemieke Boots | 7. Stoneware cup Annemieke Boots | 8. Stoneware cup July Adrichem | 9. Brass rail Schoolhouse Electric | 10. Ceramic egg holder | 11. Muji kettle | 12. Walnut wooden spoon | 13. Smoked oak serving spoon | 14. Dish brush | 15. Linen tea towel | 16. Custom oak cabinetry Koak Design | 17. White ceramic floor tiles Mosa | 18. White porcelain wall tiles (available at any tile shop or home depot store) | 19. Dust brush | 20. Original art Lola Donoghue | 21. Telescoping lamp One Forty Three| 22. CC Stool Rex Kralj | 23. 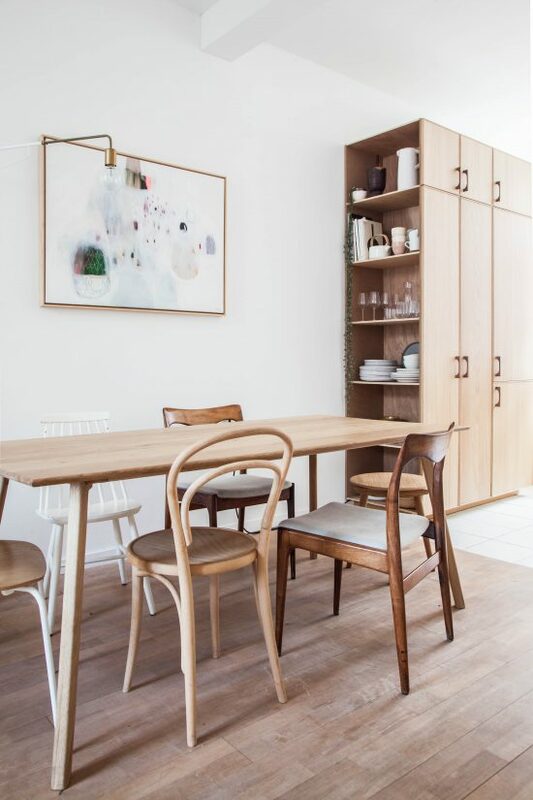 Thonet style chair Dille & Kamille | 24. Oak table Hübsch (enquiries info@avenuelifestyle.com)| 25. My Chair Normann Copenhagen | 26. Vintage | Anything I missed? Ask away in the comments section below! I hope you enjoyed this very belated tour and are looking forward to seeing the living room transformation soon! Great job, guys! See you soon! 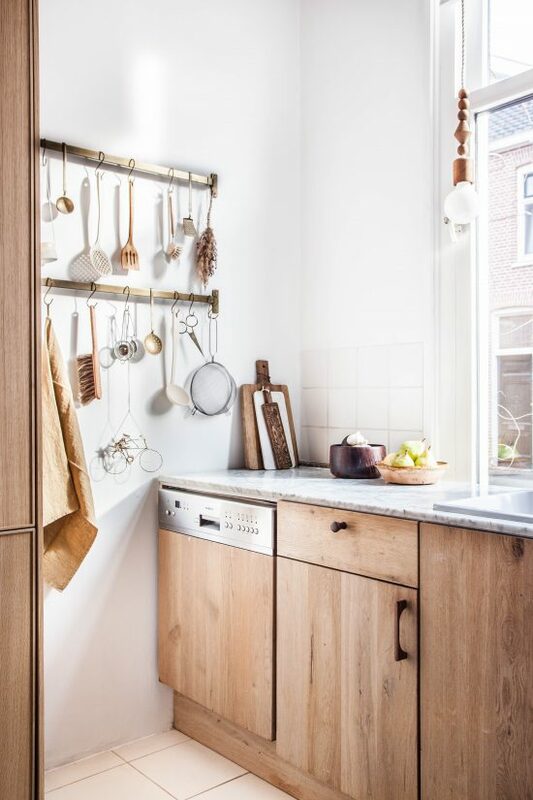 I love, love, love, love your kitchen. So simple, but yet so beautiful. Wow, I never realised you built that under the stairs storage yourself. Good job, it looks great. Seeing this pictures reminds me I promised to show you the Hubsch lamps without the cords. I’ll take pictures as soon as the shelving in the kitchen goes up and it will finally be done. I love that ceiling light in the hallway too! Would be cool for a natural bedroom too. Where’s it from? Gefeliciteerd….looks great! Question: How did you get the Ikea door fronts to cover the fridge? Ok, now I get it. Thanks. It all looks marvelous! mooi geworden Holly, helemaal jij! What a wonderful kitchen !!! Question #1: Where are those beautiful art frames from? The vintage trolley itself is from Loods5.nl. It was a green colour, which I then painted black and then this taupe colour. You need to give it a light sand all over first, apply to layers of primer (suitable for metal) and then apply two or three layers of your chosen colour paint – also suitable for metal – with a roller. Make sure you do it slowly and gently roll over the lines that will show up with each roll until get a smooth finish. You’ll get the hang of it, but don’t rush it. Hello! Your kitchen is just beautiful. 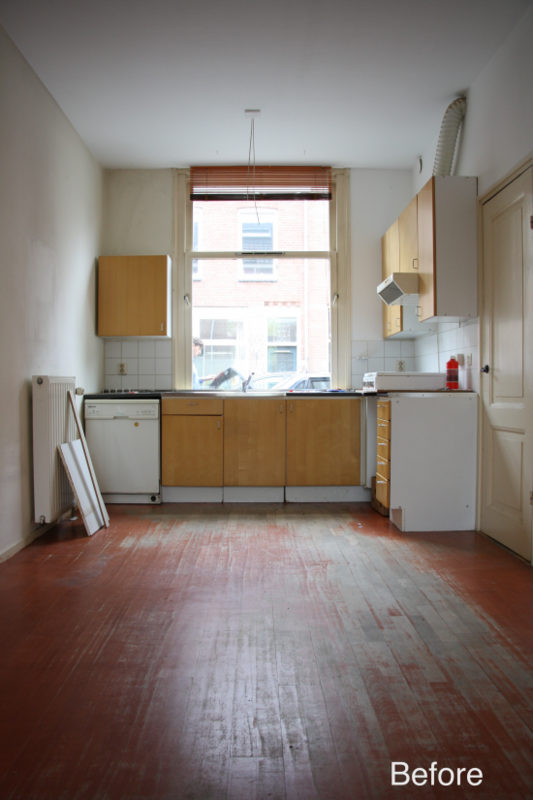 We are just about to start extending and replacing our kitchen, and yours is the kind of look I have in mind. 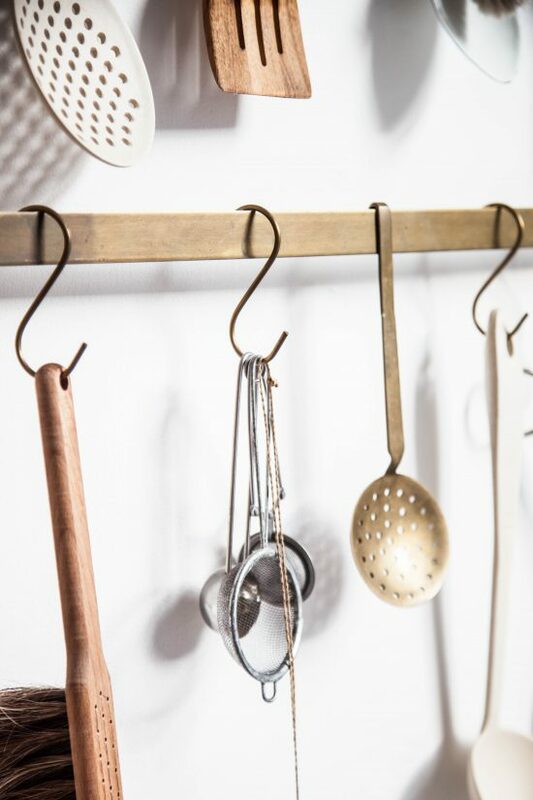 I am100% in love with your cabinet handles! We also want to do similar “freestanding” cabinets in our dining area, and are also using IKEA (Hyttan). From what did you make your shelves? 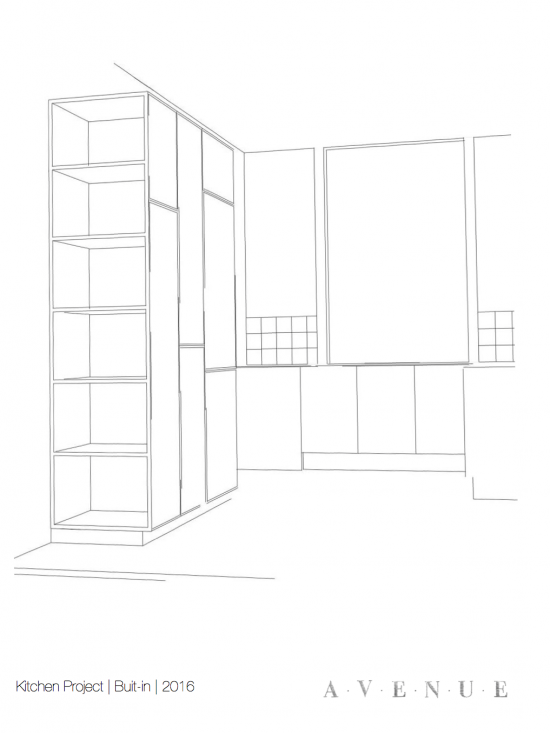 I’d love to incorporate some similar shelving, but IKEA don’t offer that. Any suggestions? hi Holly. 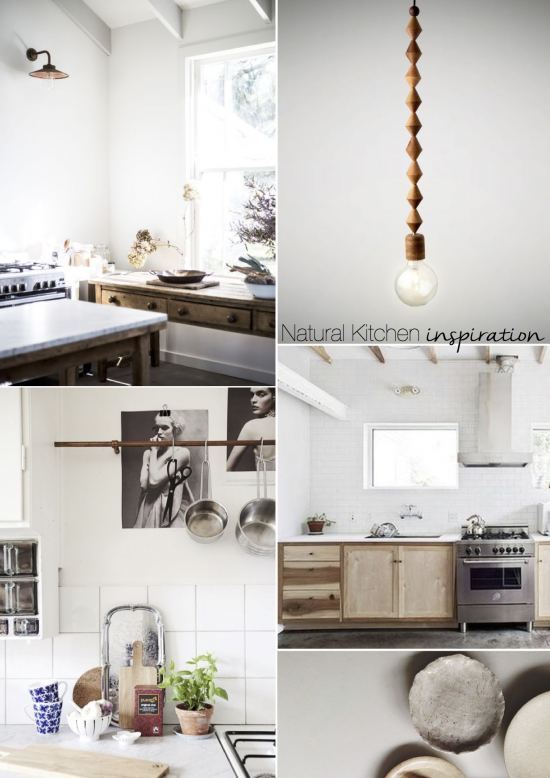 Love your blog and kitchen makeover. 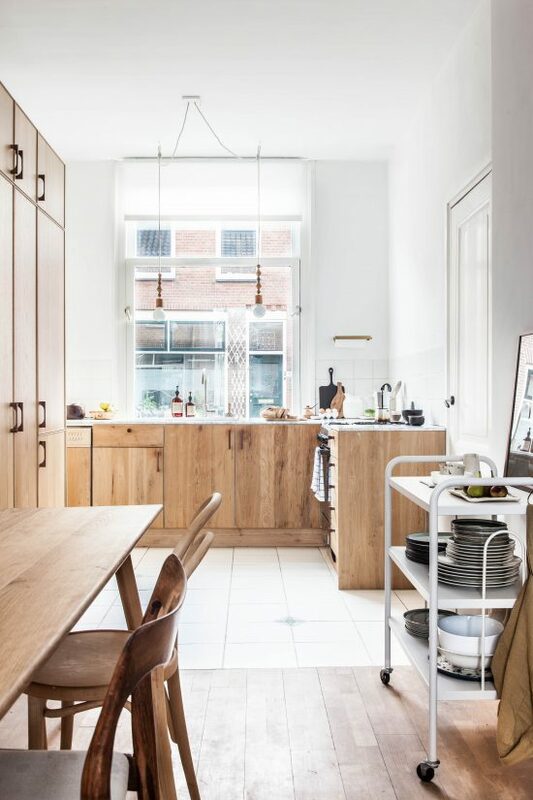 I’ve just moved from Holland to London and am missing all of my favorite Dutch design sources. I was wondering 2 things: 1/ where is your sugar pot from? and 2/ I see that Schoolhouse is based in the US. Do you just get items shipped to the NLs? I’ve always had to pay a hefty customs fee when importing things from the States so gave up. Not sure what your experience was like when getting things delivered? Hi Holly! I’m very curious which paint color you used on the trolley? Thank you for answering! Hi Holly. 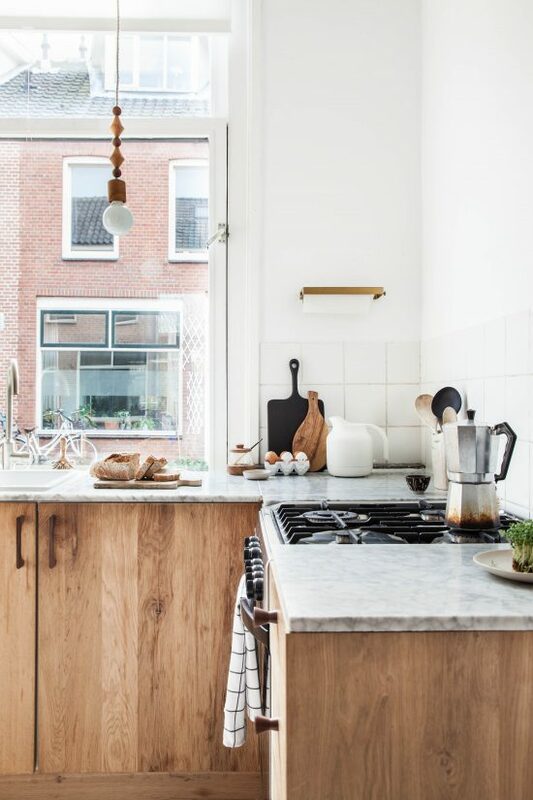 I’m totally in love with your beautiful kitchen! Can I ask if it’s the Warm Naturel 300 from KOAK Design? 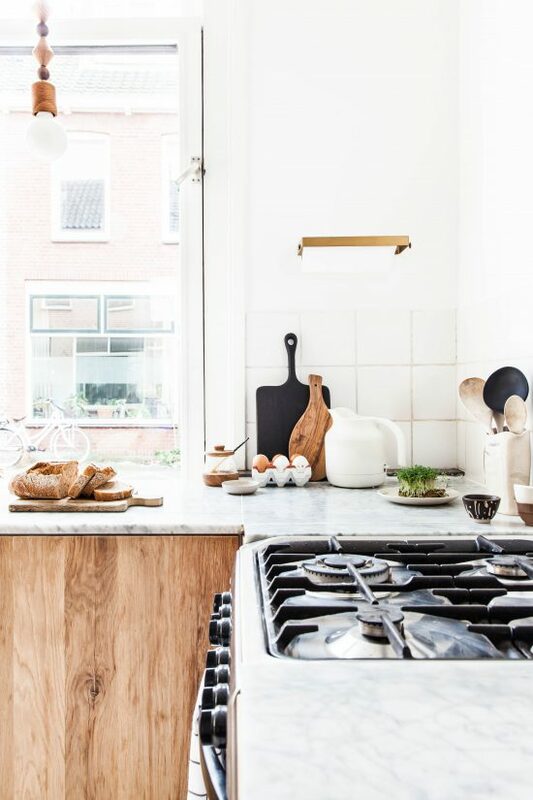 One of the most beautiful kitchen makeovers I have ever seen! Every finish is beautiful and fresh but still feels warm. 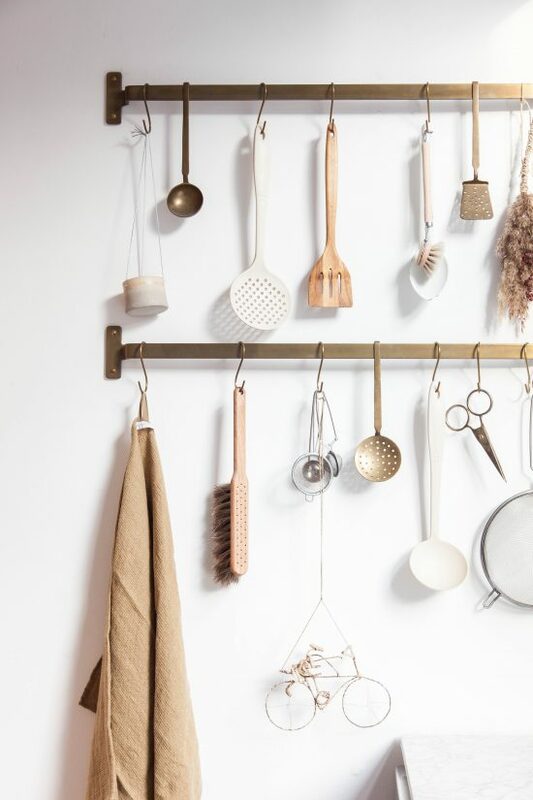 Where did you find the brass paper towel holder? 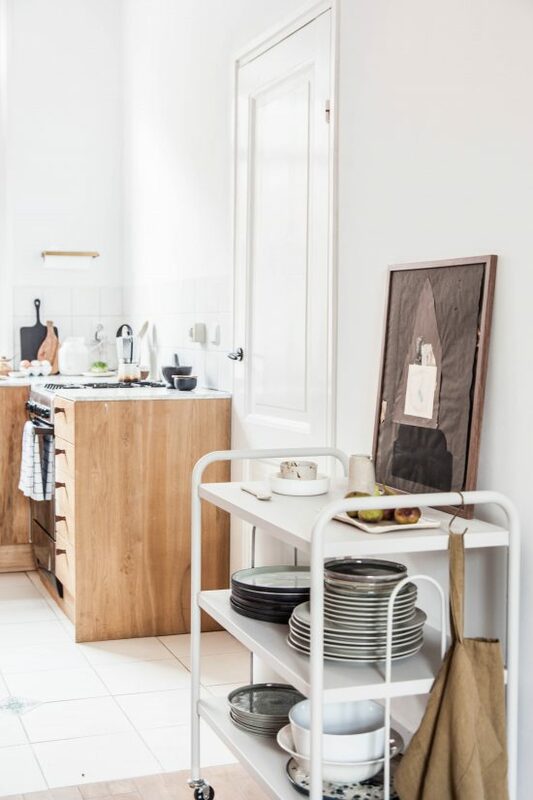 It’s perfect for a minimal kitchen!